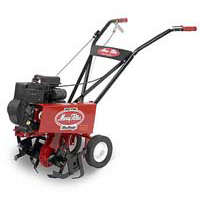 The Suburban features a double gear reduction transmission allowing the tiller to bust through just about any ground. The drag bar and wheel are easily adjusted with the simple pull of a pin. Pull one pin to release the wheels, lift them to the up position and insert another pin. The drag bar can be adjusted for different soils. Once the wheels are up and the drag bar is down, adjust the throttle from the operator’s position, squeeze the clutch handle and start tilling.